Huehuetenango (originally called Xinabahul in the Mam language) was already a Mayan settlement before the Spanish conquest of the fortified city of Zaculeu, which was the Pre-Columbian capital of the Mam kingdom situated just a few kilometers from Xinabahul. 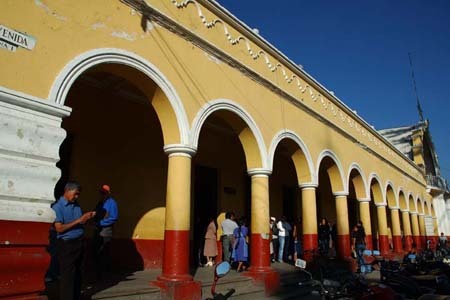 The name ‘Huehuetenango’ means place of the ancients (or ancestors) in Nahuatl which is the name Gonzalo de Alvarado adopted from his Nahua allies when Zaculeu and Xinabahul were conquered. Many people of Mam descent still live in and around Huehuetenango, and the nearby ruins of Zaculeu have become a tourist attraction. These ruins are markedly distinct from other Mayan archeological sites; the original unearthed stones, comprising only a small portion of the original structures, were coated with plaster during restoration works carried out in the 1940s. There is also a small museum at Zaculeu which includes statues and small artefacts found on the site. A small airport is currently under construction. Former president Efraín Ríos Montt was born in Huehuetenango. Huehuetenango’s primary export is coffee.